Key Transaction Monitors allow you to quickly identify critical transactions (Web Requests and SQL Queries) that APM has discovered and add a layer of intelligent, proactive monitoring & alerting around them. They'll all appear together in a sortable, filterable list complete with inline spark lines and access to deeper levels of data & customization. Whenever a new application is added, Retrace will create a default Key Transaction to monitor some basic performance metrics of all requests to that app. The default monitors are Average Load Time, Error %, Requests per Minute and Satisfaction Score. If you haven't set up a monitor before, you may want to familiarize yourself by reading our Configuring Your First Monitor guide. You can create Key Transaction for the following types of Resources by navigating to the details of each specific resource instance. These can typically be found on the Performance Tab of an App Dashboard. Application Home - Arguably the most important page on a site, so keeping tight tabs on its performance is a must. User Login - Ensure your users are getting into your application as fast as possible to begin gaining value. Shopping Cart Checkout - Speedy checkout completions reduce shopping cart abandonment. Time saved here is literally more money in the bank. Site Search - Whether your users are there to find products, home listings, or anything else, keeping tabs of the number of results returned, the query time, and other key metrics will help provide continuous improvement for your users. 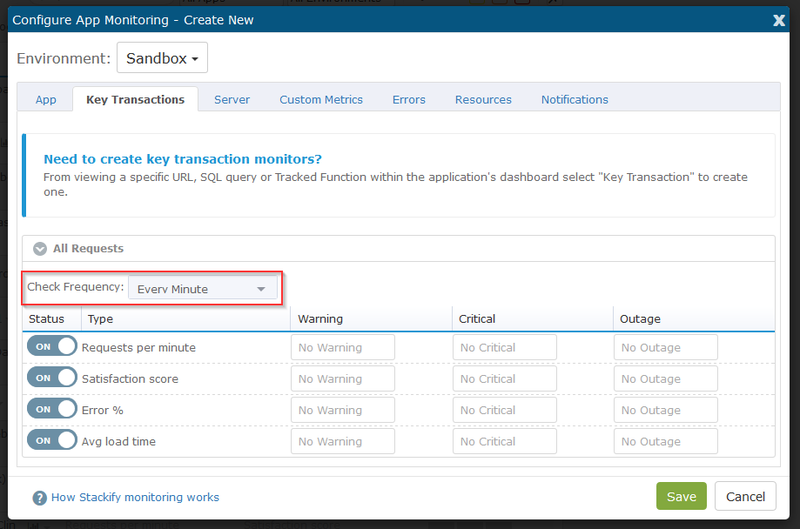 For the specific key transaction you would like to configure, click Configure from the Actions dropdown. This will bring up the monitoring configuration for that app. You can set the Check Frequency and Alert thresholds for each monitor attached to the Key Transaction. For more information on related monitors, read about App Monitors and SQL Query Monitors.